During a series of panel discussions on how best to address the opioid crisis, one factor has arisen repeatedly. It is stigma. Panelist Michelle Tuten, PhD, MSW, associate professor at the University of Maryland School of Social Work (UMSSW), devoted her remarks to the topic of stigma during the most recent presentation held in Cockeysville, Md., by the Office of Philanthropy at the University of Maryland, Baltimore (UMB). Michelle Tuten, PhD, MSW, associate professor at the University of Maryland School of Social Work, urges an end to stigma related to opioid-use disorder during a presentation that included Bethany DiPaula, PharmD, professor at the UM School of Pharmacy, and Eric Weintraub, MD, associate professor at the UM School of Medicine. Finding solutions is uppermost on the mind of those who have organized and attended the gatherings throughout the region in 2018. UMB President Jay A. Perman, MD, launched the series at an event held in April in Anne Arundel County. In September, a panel discussion was held in Howard County, and an event took place in Montgomery County in October. 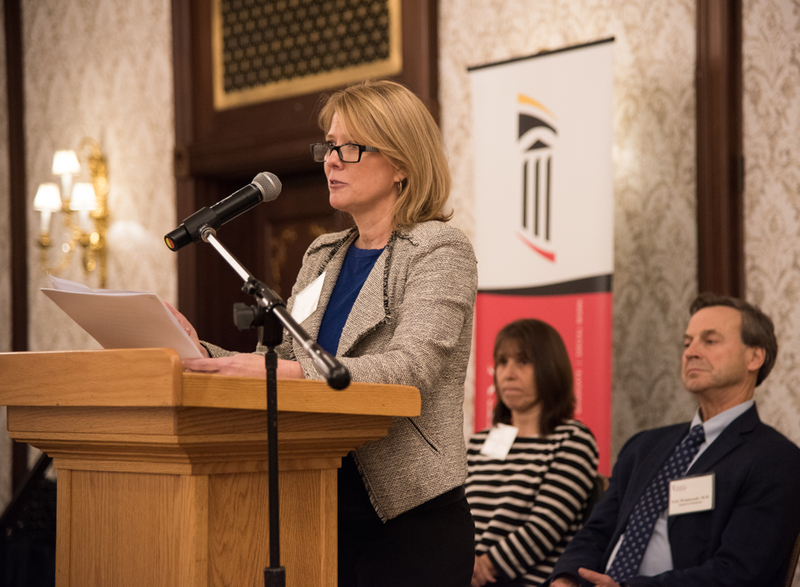 The series, “UMB: Targeting Solutions to the Opioid Crisis,” concluded Nov. 8 at the Grand Lodge of Maryland in Baltimore County with a presentation by Tuten and three other UMB faculty members who have expertise in substance abuse treatment and research. Representing the University of Maryland School of Pharmacy (UMSOP) was Bethany DiPaula, PharmD, a professor in the Department of Pharmacy Practice and Science. Representing the University of Maryland School of Medicine (UMSOM) were associate professors in the Department of Psychiatry Christopher Welsh, MD, and Eric Weintraub, MD. Weintraub, who served as moderator, reminded the invited audience of the toll: In Maryland last year, more than five people a day lost their lives to opioid-related overdoses. Contributing to stigma are significant misconceptions about opioid use disorders, said Tuten, who is co-director of the Center for Addiction Research, Education, and Service (CARES). The center is UMB’s interdisciplinary effort to address the adverse impact of addiction whose co-director is Raymond C. Love, PharmD, BCPP, FASHP, professor at UMSOP. The center is led at the decanal level by UMSSW Dean Richard P. Barth, PhD, MSW, and UMSOP Dean Natalie D. Eddington, PhD, FAAPS, FCP. These misconceptions include a perception that individuals are lacking in moral character and willpower, that usage is a choice that can be stopped at any time, that continuation is a refusal to change, and that the only real measure of success is complete abstinence during and following treatment. Indeed, voluntary control is affected by genetic vulnerability, environmental factors, and, most significantly, the effects of addictive substances in the brain, she said. Beyond the general public, inaccuracies persist even among providers, she said. These include mistaken perceptions that individuals with substance-use disorders are harder to treat, are less compliant, and relapse at exceptionally high rates. Panelists called for greater understanding among health care professionals of the effectiveness of medication-assisted therapies, such as buprenorphine and methadone, and the methods involved in administering them. DiPaula and Welsh spoke of ways that they are broadening clinicians’ knowledge in their respective disciplines. DiPaula is a board-certified psychiatric pharmacist who directs the Psychiatric Pharmacy Residency Program at UMSOP and pharmacy services at the Springfield Hospital Center in Sykesville, Md., which is operated by the Maryland Department of Health (MDH). Working under the state’s collaborative drug therapy management protocols, she has worked at several clinical sites as part of the health care team treating patients with psychiatric and substance-use disorders such as opioid use disorder. This helps meet a great need to expand access to treatment and strengthen the workforce dealing with opioid use disorders. “It’s one of those all-hands-on-deck situations,” DiPaula said, noting that pharmacy can be seen as “under-utilized as a profession” in regard to the opioid crisis. “We hope to spur some discussion of what we can be doing in the future,” she said. Welsh is medical director of outpatient addiction treatment services at the University of Maryland Medical Center (UMMC). As medical director of the Substance Abuse Consultation Service at the hospital, he oversees substance abuse assessment and intervention with patients throughout the medical center. Welsh also works statewide and locally with the MHD and the Baltimore City Health Department on expansion of treatment for opioid use disorders, needle exchange, opioid overdose prevention, and other harm-reduction initiatives. “We try to treat people when they’re willing and ready,” he said, referring to a multidisciplinary team that provides consultations and sees dozens of people per day who are admitted to UMMC for a variety of reasons. Welsh told the group he is working with Baltimore City to help other hospitals replicate the model. Beyond that, he said, “We’re trying to help throughout the rest of the state.” For example he and other experts are now on call when primary-care physicians need to consult with them about addiction treatment. Calls that were initially focused on methadone and buprenorphine now extend to complicated pain management, he said. During a question-and-answer session, several in the audience identified themselves as health care providers who were eager to share insights with the panelists representing UMB.